For years, reporters were content to obscure their ideological dogmas and partisan goals behind the pretense of objectivity and detachment. Though the Washington Post, New York Times, and CNN practiced combat journalism against conservatives and Republicans, they did so while aspiring to professional standards of facticity and fairness, and applying, every now and then, scrutiny to liberals and Democrats worthy of investigation. Donald Trump changed that, of course. He is so unusual a figure, and his behavior so outlandish, that his rise precipitated a crisis in a profession already decimated by the collapse of print circulation and advertising dollars. The forces that brought Trump to power are alien to the experience of the men and women who populate newsrooms, his supporters unlike their colleagues, friends, and neighbors, his agenda anathema to the catechism of social liberalism, his career and business empire complex and murky and sensational. Little surprise that journalists reacted to his election with a combination of panic, fear, disgust, fascination, exhilaration, and the self-affirming belief that they remain the last line of defense against an emerging American autocracy. Who has time for dispassionate analysis, for methodical research and reporting, when the president's very being is an assault on one's conception of self, when nothing less than the future of the country is at stake? Especially when the depletion of veteran editors, the relative youth and inexperience of political and congressional reporters, and the proliferation of social media, with its hot takes and quips, its groupthink and instant gratification, makes the transition from inquiry to indignation all too easy. There is still excellent journalism. I would point, for starters, to the work on charter flights that led to the resignation of Tom Price. But the overall tone of coverage of this president and his administration is somewhere between the hysterical and the lunatic. Journalists are trapped in a condition of perpetual outrage, seizing on every rumor of discontent and disagreement, reflexively denouncing Trump's every utterance and action, unable to distinguish between genuinely unusual behavior (the firing of Comey, the tenure of Anthony Scaramucci, the "fine people on both sides" quip after Charlottesville) and the elements of Trump's personality and program that voters have already, so to speak, "priced in." Supposedly authoritative news organizations have in one case taken up bizarre mottoes, like "Democracy Dies In Darkness," and in another acted passive-aggressively by filing Trump stories under "entertainment," only to re-categorize the material as news with the disclaimer (since dropped) that Trump is "a serial liar, rampant xenophobe, racist, misogynist, and birther." The mode of knee-jerk disgust not only prevents the mainstream media from distinguishing between the genuinely interesting stories and the false, partisan, and hackwork ones. It also has had the effect of further marginalizing print and broadcast journalists from middle America. The other day, for example, Bob Schieffer observed on Face the Nation that one in five journalists live in New York, D.C., or Los Angeles. The news is manufactured by residents of the liberal bubble, where conservatives are few and far between (and certainly do not sound like Sarah Palin), jobs are plenty, education is high, and the benefits of globalization manifest in cheap prices, exotic restaurants, and a reserve labor force of cleaners, contractors, and home care specialists. Can't say I was shocked when Schieffer's finding passed barely noticed, the consciences of the press untroubled by the fact that their experiences and backgrounds are so unlike the majority of the public whose interest they presume to uphold. 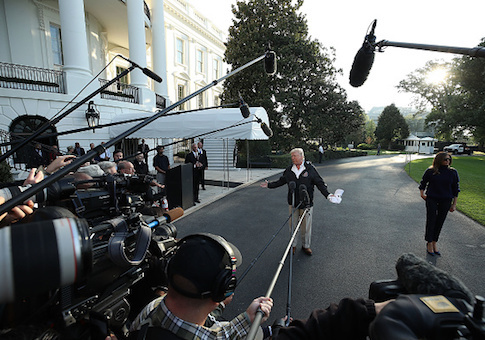 Nor was I stunned when a major report from the Pew Research Center found that "about six-in-10 news stories about Trump's first 60 days (62%) carried an overall negative assessment of his words and actions. That is about three times more negative than for Obama (20%) and roughly twice that of Bush and Clinton (28% each)." This, at a time when the stock market is at record highs, the economy is at full employment, and Americans are upbeat about the recovery. The president's inability to register majority approval in opinion polls may be unprecedented, but so is the amount of negative coverage he has received. Perhaps there's a connection. Trump does not change, but his critics in the media have. Their feelings of revulsion toward him have deepened. Their eagerness to oppose him has become more acute. The scope of their vision has constricted to include only Trump: what he says, Tweets, and does. The context in which he operates is invisible to them. When he raises the question of what the ultimate outcome of the removal of Confederate statues might be, the critics slag him as a racist, but do not dwell for long on polling that shows him to be in the center of public opinion. When he voices what many have felt about the politicization of the NFL and the attack on the flag and national anthem, the critics say he is being divisive and insensitive. But why is it always Trump who is being divisive, and not those who say the flag and anthem are symbols of white supremacy, and who raise fists in the black power salute? Ever since Hurricane Maria devastated Puerto Rico, I have looked up from my desk to find San Juan mayor Carmen Yulín Cruz on CNN attacking the White House response. Her selection of hats and T-shirts was far more varied than her anti-Trump message. Her verbal assaults mounted to the point where she accused him of presiding over "something close to a genocide." Yet when Trump defended himself and FEMA on Twitter the next morning, it was he, not she, who was "lashing out." The desire on the part of Trump's critics for Maria to become his "Katrina moment" is palpable. It has led reporters to disregard their own previous work on the dismal condition of Puerto Rico's governance, finances, infrastructure, education, and public health systems, not to mention the fact that it is more than a thousand miles away from the mainland. It has inspired articles suggesting that an influx of Puerto Ricans to Florida "could well prove to be a boon to Democrats." (They said the same thing before 2016.) It spurred Paul Krugman to circulate the fake news that cholera had appeared on the island. Most ridiculous was the Bloomberg story, "Trump's Puerto Rico Feud May Cause Lasting Damage to the GOP," whose authoritative and objective sources included an academic, Chuck Schumer, Bernie Sanders, and John Brennan. As I watched Trump visit the island Tuesday, I saw crowds that looked pleased to see him, eager for his help, and even chuckling at his irreverence. Yet the commentary from D.C.- and New York-based pundits, uniformly hostile to the president, was that his appearance was an unmitigated, embarrassing, insulting disaster. Whom to believe, the folks who thought Hillary had it in the bag, or my own lying eyes? "Media-driven myths are tales of doubtful authenticity, false or improbable claims masquerading as factual," writes W. Joseph Campbell in Getting It Wrong: Debunking the Greatest Myths of American Journalism. "In a way, they are the junk food of journalism—alluring and delicious, perhaps, but not especially wholesome or nourishing." If that is the case, then since Trump's inauguration the media have been bingeing on Frito Lays. Among Campbell's subjects is the "flawed and exaggerated" coverage of the Bush administration's response to Hurricane Katrina. "On crucial details, journalists erred badly and got it wrong." Perish the thought that journalists might be getting some of the crucial details of the Trump administration's response to Hurricane Maria wrong, as well. By the time of the mass shooting in Las Vegas, and the inevitable calls for gun control in its aftermath, I was once again reminded that much of what I read or watch contains no information whatsoever. "It has become impossible to report just ‘facts' about gun violence," Tweeted a reporter for NBC, without any acknowledgment that if he is tired of "facts" he might have chosen the wrong profession. Then again, maybe he's in exactly the right place. What passes for news today is speculation and advocacy, wishful thinking and self-fashioning, mindless jabber and affirmations of virtue, removed from objective reality and common sense. The content is intended not for the public but for other media. In a recent interview with Peter J. Boyer about her institution's study of press coverage of Trump, Amy Mitchell said, "One of the things that was interesting to see was that, while the topic of the news media was not a huge percentage of overall coverage, journalists were both the second most common source type as well as the second most common ‘trigger' of the stories." The CNN anchors aren't talking to you. They are talking to one another. The conversations that journalists in New York and D.C. and L.A. trigger among themselves have very little to do with the conversations between most people, in most places, at most times. The conversations are self-referential, self-sustaining, self-validating, and selfishly concern one topic: the president of the United States. That may be why his critics in the press are so fixated on his Tweets. Twitter is his way of talking back. It's how he pops the liberal media bubble.